During World War I it was the task of the U.S. Department of Justice, using the newly passed Espionage Act and its later Sedition Act amendment, to prosecute and convict those who opposed America's entry into the conflict. 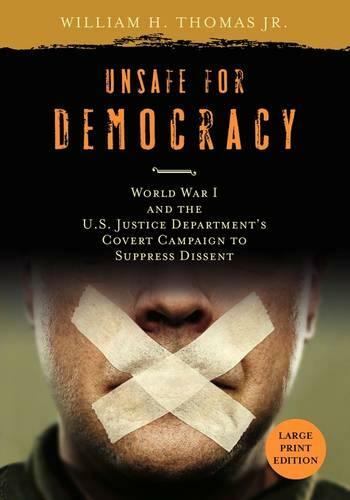 In ""Unsafe for Democracy"", historian William H. Thomas Jr. shows that the Justice Department did not stop at this official charge but went much further - paying cautionary visits to suspected dissenters, pressuring them to express support of the war effort, or intimidating them into silence. At times going undercover, investigators tried to elicit the unguarded comments of individuals believed to be a threat to the prevailing social order. In this massive yet largely secret campaign, agents cast their net wide, targeting isolationists, pacifists, immigrants, socialists, labor organizers, African Americans, and clergymen. The unemployed, the mentally ill, college students, schoolteachers, even schoolchildren, all might come under scrutiny, often in the context of the most trivial and benign activities of daily life. Delving into numerous reports by Justice Department detectives, Thomas documents how, in case after case, they used threats and warnings to frighten war critics and silence dissent. This early government crusade for wartime ideological conformity, Thomas argues, marks one of the more dubious achievements of the Progressive Era - and a development that resonates in the present day.